Design of altyo allow open unlimited tab count, even with long terminal title. if tabs not fit in the row, they move to a new line. Title of the tabs fully customisable. You can adjust the header of the terminal, using regular expressions(for example cut unnecessary parts). Autostart programs,for example, start mocp and mutt in new tabs by default. Program will warn you if you try to close the terminal with an important program(ssh,wget pattern is customizable), even if program runned in the background. Delayed "Close tab", you have 10 seconds before tab will actually closed, so if you change your mind, press R to restore tab, also you may restore tab from terminal popup menu. All options can be configured via graphical settings dialog. Program will warn you if you setup incorrect setting value, if settings is absent in config file, program will use default value. You can setup, on which monitor start by default. Individual window size and position for each monitor. Program have mode "Follow the mouse", in this mode, after hiding, window will shown on same monitor with mouse pointer. 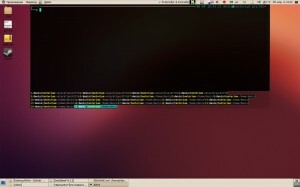 Tiling window manager support (usual window). For any other window managers, altyo will operate as usual terminal emulator (like xterm). Multiple instances. You may run several instances of alto in same time. To do that you should setup unique id for each instance and use separate configuration file. If you don't want invent unique id, you may use --id=none, but in that case you will have no possibility to control instances from command line.